I attended my very first harp recital at Crocker Art Museum on Sunday. Rachel Brandwein is this year's winner of the Mu Phi Epsilon solo competition. I had my normal reaction to this, which was to find out everything there was to know about harps and playing harps. I'm sorry if you wanted adjectives. It was lovely. Will that do? According to Wikipedia, the "double action" pedal harp was patented in 1807 by Charles Groll. This type of harp has two features which put it completely in synch with progress in the other musical instruments which form the modern symphony orchestra: it is louder than traditional harps, and it can play in all 24 major and minor keys. Being a tirelessly curious person, I asked Rachel if it would be possible to play 12 tone music on a harp. She said that Elliott Carter had tried it, but in general it would be insanely difficult. You would need to constantly change the pedals. The pedal harp is designed to allow for lots of modulation, but does not facilitate being in all the keys at the same time. The pieces were selected to go with the current Crocker exhibit Toulouse-Lautrec and La Vie Moderne: Paris 1880–1910. This worked well for Rachel, since she loves best the French repertoire. 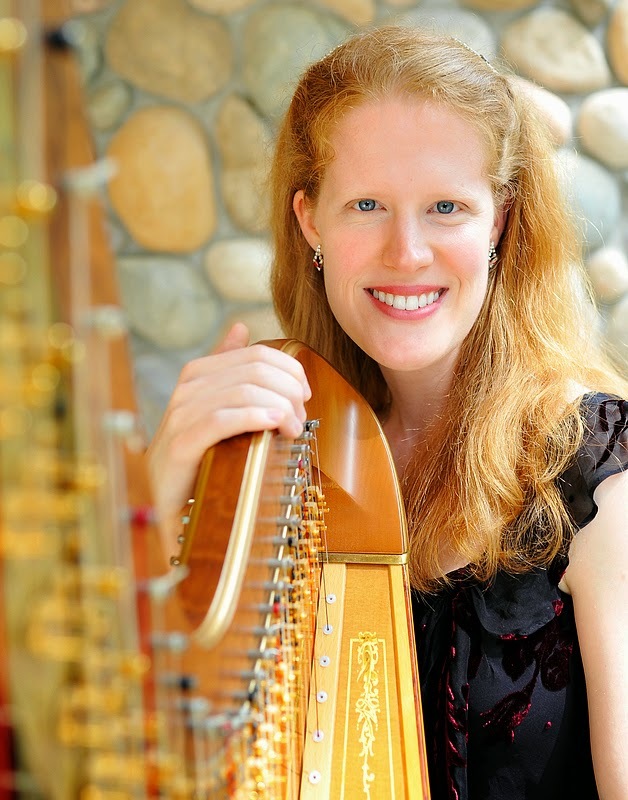 Rachel included a piece called "Sérénade pour harpe" by Elias Parish Alvars, an Englishman (1808-1849). Hector Berlioz wrote about him, "In Dresden, I met the prodigious English harpist Elias Parish Alvars, ... This man is the Liszt of the harp. You cannot conceive all the delicate and powerful effects, the novel touches and unprecedented sonorities, that he manages to produce from an instrument in many respects so limited." He is sort of in at the beginning, treating the harp as unexplored territory and inventing new things to do with it, enough to impress Berlioz. This piece was rather fascinating, including harmonics, among other things. She also played "Le Rossignol" by Franz Liszt. This would have been one of Liszt's popular pieces since it is based on a well-known children's song. It is not well-known by me, but was nevertheless nice to hear. For the International Women's Day, which was also on Sunday, she played "Sonate pour harpe," a piece in 3 movements by Germaine Tailleferre, the only female member of Les Six. Rachel Brandwein is also a composer, and her recital included 3 pieces of her own composition. She experiences synesthesia. Music makes her think of colors. One of her pieces is called "Colors Within." She is very skilled with her instrument and a very expressive player. I will probably not become a harp blogger, but here's a little harp music to close. I think this is the Tailleferre she played.